Wholecloth painting or I’m obsessed…. I recently took Susan Brubaker Knapp’s class on wholecloth painting and LOVE, LOVE, LOVE this technique. I think I’ve finally found a technique that I can do quickly. I loved the all fabric fusing technique but my tulip quilt took about a year to produce…I need things to move along faster than that. I finished the class project and already had several ideas for other projects to do. 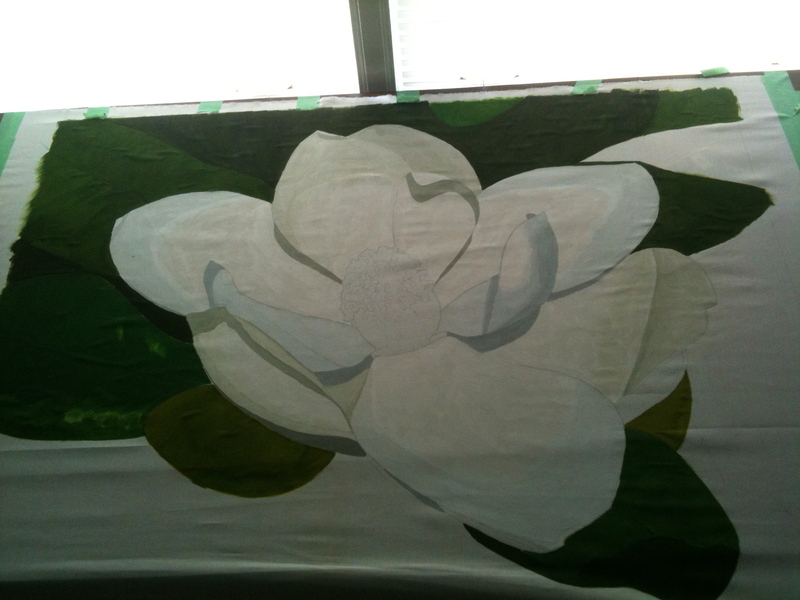 The first project was a magnolia. 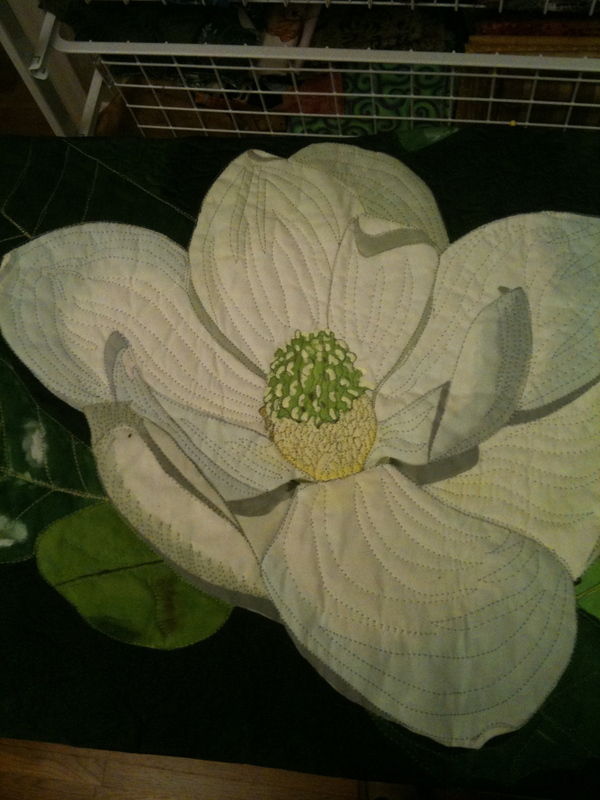 I think this is the most perfect magnolia I’d ever seen….no blumishes, no brown stops, it was stunning. I think the bloom must have opened that morning and was waiting for me to take it’s picture. I followed Susan’s instructions to the “T”. 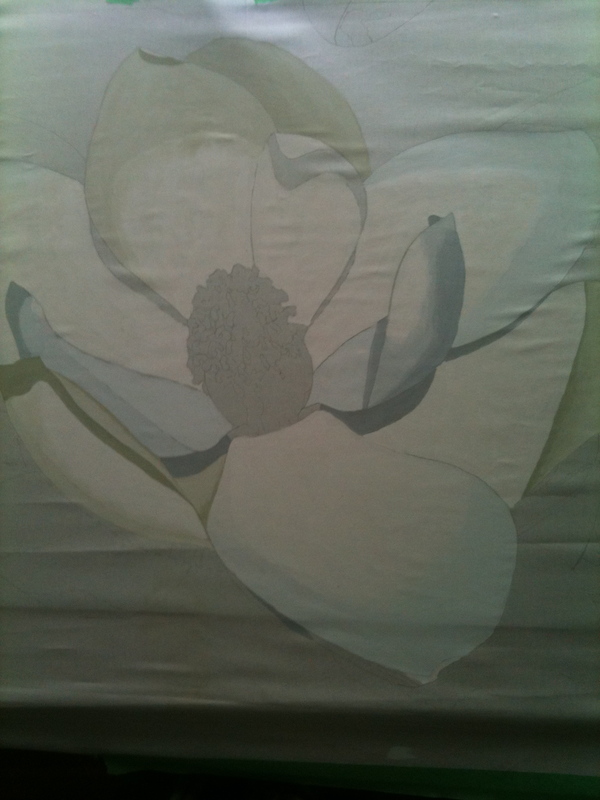 Enlarge image, trace image on tracing paper, trace image on PFD fabric and paint. Here is the first one I did. I’ll call it the study. I think it turned out quite nicely. At first, I didn’t like it at all but I finished it and it started growing on me. There are a few things I’d change but over all I’m very pleased. I keep telling myself, it’s a learning process, let go. So, since this was a study I’ve moved on to the full size version I’ve been wanting to do. It will be approximately 30x 40 when it’s complete. Below is what I accomplished last week. And below is what I accomplished this weekend. Sorry photos are not so good. I took them quickly with my iphone when I didn’t have much light.